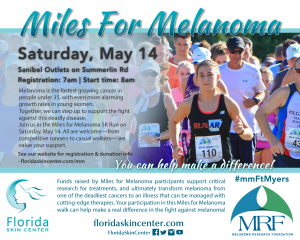 Pediatric Dentistry of Ft. Myers, Dr. Tim Verwest, DMD will sponsor the Miles for Melanoma 5k race on Saturday, May 14, 2016 at the Sanibel Outlets. 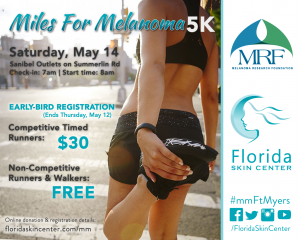 Florida Skin Center will play host and all proceeds will go to support the Melanoma Research Foundation. “In 2016, its estimated 1 in 25 Americans will develop melanoma, that’s something we want people to be aware of, especially living in the sunshine state,” said Dr. Verwest. Registration begins at 7 am and the race begins at 8 am. Early bird registration for the 5k timed version is $30 for runners and is free for untimed runners. 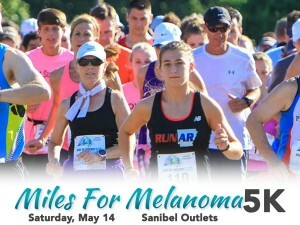 For more information visit www.floridaskincenter.com/miles-for-melanoma.php.